Google Pixel 2 Launch Event May Happen on October 4 - Playfuldroid! Popular leakster Evan Blass had claimed that the Google Pixel 2 and Pixel 2 XL phones will be launching on Oct. 5. However, a new billboard that has spotted in Boston suggests that Google will be holding a launch event on Oct. 4. 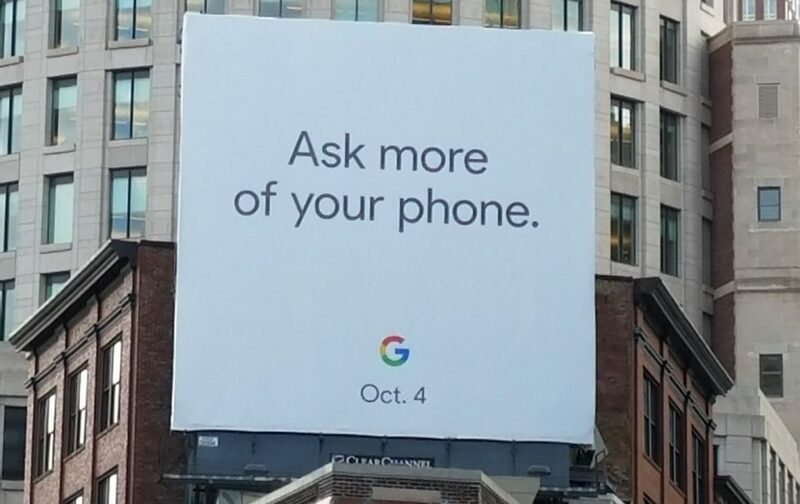 In the image above, the billboard can be seen with the text “ask more of your phone.” At the bottom of the billboard is the colorful Google logo with Oct. 4 date below it. In 2016, the search engine giant had unveiled its very first Pixel and Pixel XL smartphones. The unveil event for the original Pixel phones were kept on Oct. 4 and in India, the smartphones were unveiled on Oct. 5. Hence, it appears that the company may use the strategy for debuting the Pixel 2 smartphones this year. Fresh information suggest that the Pixel 2 and Pixel 2 XL will be coming with identical specifications, but the only department they will be differing is display. The Pixel 2 is expected to house a 5-inch FHD display whereas the Pixel 2 XL is pegged to arrive with a full screen design featuring a 6-inch QHD display. Rumors have revealed that HTC is building the Pixel 2 phone whereas the LG is manufacturing the Pixel 2 XL phone. However, these phones will be launching as “madebyGoogle” devices like the predecessor phones.